Umbilical cord and tissue stem cells allow for a better matching between the donor and the recipient, in comparison to bone marrow-derived stem cells, especially if the donor and recipient are related. Human Leukocyte Antigens (HLA) are proteins on the surface of cells that determine the tissue type of a person. The immune system uses the HLA’s to differentiate its own cells from that of other (non-self) cells. To successfully receive tissue, from another person, the tissue type has to be the same otherwise the recipient’s system will see it as foreign and it will reject the donated tissue. Haemoglobinopathy (a blood disorder caused by a genetically-determined alteration in the molecular structure of haemoglobin) testing on cord blood is also endorsed, as there are certain inherited blood-disorders where stem cells cannot be used, as these stem cells have acquired the genetic mutation. Umbilical cord blood and tissue stem cells have many advantages over other stem cell resources as there are less stringent (HLA) matching requirements than stem cells from other resources, as discussed. Also, the afore-mentioned haemoglobinopathy testing, as well as testing of cell counts and viability are done at the time of stem cell transplantation. Rigorous maternal blood tests and sterility testing are done at birth to test for transmissible diseases that are not routinely done with stem cells from other resources. In the present, there are controlled clinical trials and epigenetic studies that have already provided the knowledge to distinguish the field of umbilical cord stem cell transplantation and regenerative therapy. There are ongoing trials that can be accessed from this link https://clinicaltrials.gov/, with regards to the use of umbilical stem cells in autologous and/or allogeneic transplantation in the isolated or adjunctive treatment of numerous conditions. There are also multiple clinical trials that have been published on reliable scientific databases such as Pubmed, Ovid and Cochrane to substantiate the importance of the field of umbilical cord and tissue stem cells in different diseases. 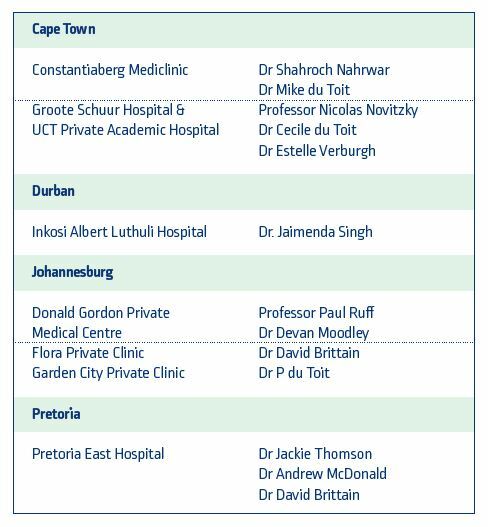 There are stem cell transplantation facilities available in South Africa. Personalized Regenerative Medicine. Arjmand B, Goodarzi P, Mohamadi-Jahani F, et al. Acta Med Iran 2017;55(3):144-149.